There are several building projects underway in Boston which will transform the cities skyline. Currently, the largest building in Boston is the John Hancock Building which towers 60 stories (790 ft.) over Boston. The new construction jobs underway would bring eight new towers of similar size, and larger, to the city skyline. This is revolutionary for Boston, a city which features mostly smaller towers around the 400 to 600 ft. range. Many of these new towers feature luxury private residences, such as condos and apartments. They will also bring new high-end hotels, premier office spaces, and new shopping centers to the city. Most of these projects have construction under way, some finishing as early at 2020. However, some are still in the stage of seeking city approval. The most controversial of these new additions is the Winthrop Square Garage Conversion, at 240 Devonshire St. 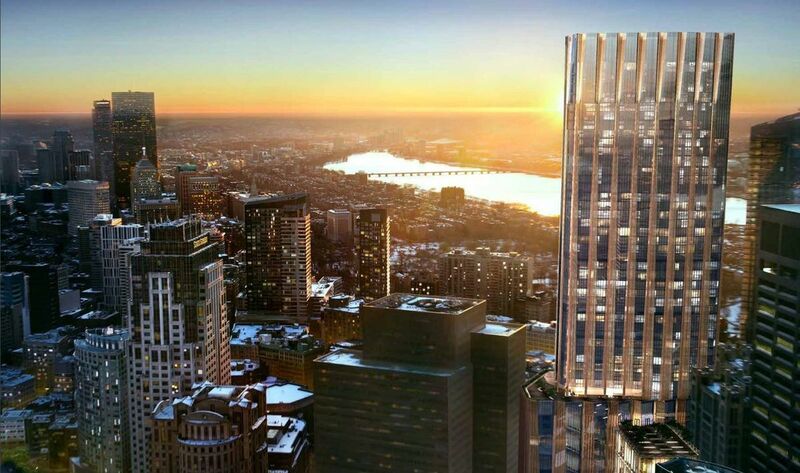 This 775-foot spire tower would be the tallest residential tower in Boston. The tower is being heavily debated because of the shadow it could cast across the Boston Common and Public Garden. With its current plans, the shadow would add as much as 90 extra minutes of shade over the area in the morning. While this is an issue of a policy, the laws preventing new shadows across the public space were written in 1970s, most of the city appears to be in support of the new tower because of the benefits it would bring to the city. There are also efforts to lower the height or change the shape of the new building in order to limit its impact, because of this and the support they have, it appears we will see this structure a few years from now. These new projects provide exciting new opportunities to attract new businesses and residences, along with increases in tourism. The full list of planned projects can be found below.